This guest post is from Michelle Belto who will be teaching at EncaustiCamp in July. This is what you will learn if you sign up for her class. When I got married, I didn’t know the first thing about cooking. Unfortunately, my new husband liked to eat…and eat often! Thinking that it would be something easy, he informed me that his favorite side dish was mashed potatoes and that “it would go with everything.” What he didn’t realize was that even the lowly mashed potato was beyond the level of my expertise. I remember calling up my mom with a raw potato in my hand and asking the question: How do you get from here to there? I often get asked that question about my work. How did you get there? For those who will be attending the first ever Encausticamp in Portland this summer, you will get there yourself! Beating cotton and rag into a giant slushy pulp and then reforming it into something wonderful is addicting. 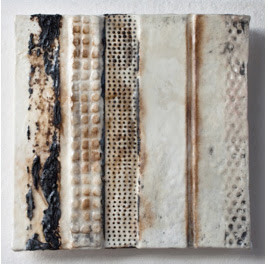 What’s more making your own supports will open the door to endless new ways to explore mixed media work, sculpture, and, of course, encaustic painting. Participants will first learn how to make pulp from ordinary recycled materials. 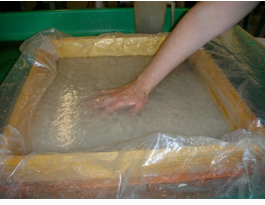 We will use the pulp in a pour-mold (1) which will allow us to add cool things like glitter and cut up newspaper or embed threads or botanicals. 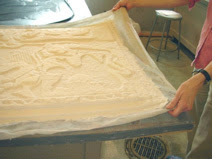 Our form, created from foam core and other materials, will be embedded in the pulp. This will make the support stable enough to take the wax. (2)The next step is to remove the water by pressing. One of my students is hand-pressing the pulp. See she is smiling! It is fun! (3) The final step is to allow the form to dry…and voila! You have just created your one-of-a-kind support. Doesn't this look like fun? 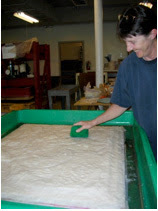 Wow, I can't wait to meet Michelle and see what she does with wax and molded paper pulp. There is nothing like a bit of 'hands on' to get the creative juices flowing.